After some great suggestions by Anil Adisesh I have found a way to include three levels of complexity into my epidemiological database while only presenting two levels of charts. More work for me but I needed the push from the medical community to make it happen. For those who have previously looked at my epidemiological/occupational charts (mainly H7N9/MERS) they will see a big uptick in numbers as I add Retirees (Provisional) to my count. The detail will be in my notes but I am now treating those over a certain age (dependent on national legislation) as retirees unless the State in question gives me some the World Health Organisation suggested occupational details. 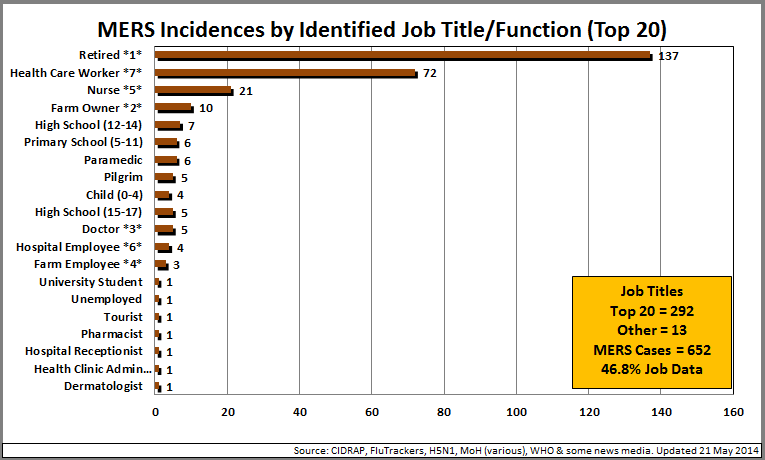 This infographic looks at those infected with MERS-CoV by Job Title. Some job titles do ‘roll-up’ in terms of function, thus a Nurse and a Nurse (ICU) are shown under the same horizontal data-point (see Key Notes). Retirees (1) there are 137-retirees represented in this chart but only 1/137 can be confirmed (less than 1%). According to the Saudi Arabian Shoura Council the official retirement age for citizens is now extended from 60 to 62 (effective 21 May 2014) but this does not include female citizens (55?) or residents (reducing from 60). The other country of interest is the United Arab Emirates where the retirement age is 65. In terms of my occupational data anyone over the age of 63 (KSA) and 66 (UAE) is considered retired unless their occupation data is known. Farm Owners (*2*) includes Camel Breeders & Farm Owners (Camels). Doctor (*3*) includes Doctor (ICU). Farm Employee (*4*) includes Shepherd. Nurse (*5*) includes Nurse (ICU). Hospital Employee (*6*) includes Hospital Domain Worker. 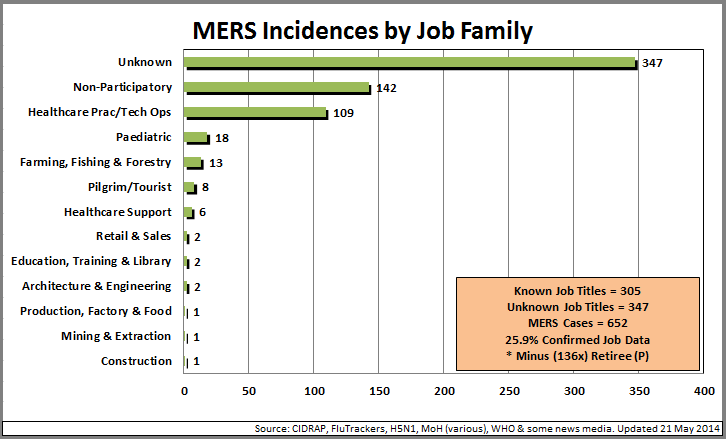 This infographic looks at those infected with MERS-CoV by Job Family. In short I think this is a key infographic for MERS as it gives you some confidence in the key narratives (i.e. that Health Care Workers are over represented in the data as an example). Paediatric(s) only make up 2.8% of the data inputs. Seems low, especially compared against H7N9 but I’m no virologist, just an amateur flublogist. 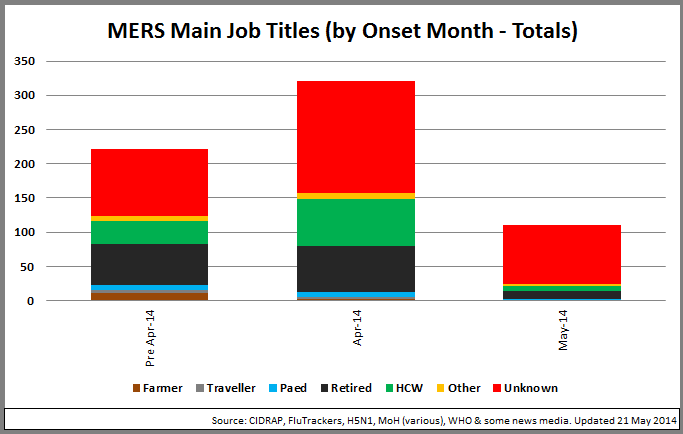 The last chart looks at those overall main job families that are most impacted by MERS-CoV (specifically Farmers, Travellers, Paediatrics, Retired, HCW’s, Other and Unknown). Farmer (2.0%): It is thought that MERS-CoV is initially spread by the handling of camels. Not represented by the known data so probably underrepresented or the wrong narrative. Traveller (1.2%): One of the great concerns was of pilgrims and tourists spreading the disease far and wide. Again, not strongly represented by the data. I suspect it is suppressed data. Paediatrics (2.8%): Any children reported between 0 – 14 years of age are here. Data doesn’t seem to show strong family clusters but I wonder given the P2P data we do know (amongst HCW’s) seem to show strong secondary infections amongst close working colleagues. HCW (16.9%): Health Care Workers of any description but doesn’t include Health Support workers. Often a good indicator of secondary infections potency. Subject Matter Expert(s) on HCW infections are m’coll’s Ian Mackay and Maia Majumder. Other (3.1%): All other occupations that have been publically released. Unknown (53.2%): Unknown occupations. It should be noted that I have ‘guessed’ 136 occupations as ‘Retired’. I now call on Professor Crawford Kilian to add Adel M. Fakieh to the Supari Prize list along with the previous Saudi Health Minister. As many have noted although we saw an initial uptick in publically sourced data from the Saudi MoH the data has now precluded data around occupation (HCW specifically) and expatriate status. This is now pure suppression of data and will no doubt lead to more cases ‘exporting’ from the Kingdom to other countries, including the United States which has now experienced two exported cases and one secondary infection.